Clermont Carpentry provides a complete design and build joinery service for private clients and commercial businesses. The company was started by William Jones who has extensive experience in fine furniture and a successful background in the building industry. Each project is unique. Whether you have a clear idea of what you’re looking for or require guidance to understand what will work best for you, we ensure that we stick clearly to your brief and budget. Each stage in the process is rigorously monitored and a designated member of our team is constantly contactable from start to finish. The team behind each project comprises highly skilled designers, craftsmen and decorators with over 20 years’ experience. Each tradesman is on hand to meet your ideas and vision whilst ensuring that the best of British craftsmanship and service is maintained throughout. The variety of work ranges from the design and build of a wardrobe or bookcase to multiple pieces throughout a residential home. We also provide a bespoke fine furniture service for those that would like a one off piece of furniture that they will be proud off. If you also require the full design and installation of a new retail unit we are available to meet your requirements. What singles us out from the rest is simply down to our attention to detail, the construction techniques that we use, our knowledge and pride in our finishing and above all total peace of mind for our clients. Dreaming of your own bespoke furniture? Our Concept Linea brand truly opens up the world of beautiful and desirable fixed furniture and joinery to everyone. We love to take Based in West London, we are a traditional joinery business employing joinery specialists with bags of energy and talent. Our experience in the construction industry is wide, we began offering our joinery services while carrying out larger building contracts and have gone on to specialise in this field. We offer a very competitively priced solution which enhances your home or workspace and adds function and form to sometimes small and unusable spaces. Get in touch with us today! We are able to produce anything from high-end bespoke kitchens to large wardrobes shelving units. 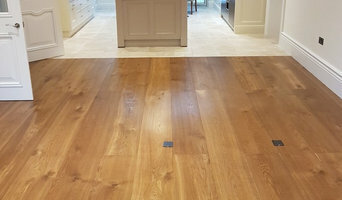 Wood flooring ,decking -sales and installation Solid wood pieces-Tables, decking, fencing , shelving Handmade bespoke woodwork..
Joinery/carpentry firm specializing in domestic woodwork from staircases to bespoke fitted furniture. Our founder Tristan Titeux started off in 2003 fixing anything to do with wood in peoples houses. He never said no to anything and now has a team of carpenters around London and the UK who specialise in designing and building bespoke furniture. Tristan's passion is in promoting sustainable wood and natural materials. Empatika has been supporting our chosen charity, World Land Trust (WLT), since 2013 and has, to date, saved 40 acres of tropical forest in Colombia. For every furniture commission over £5000 we buy one acre of the rainforest in your name. We specialise in designing and making contemporary bespoke fitted furniture using sustainable materials and paints for private clients in London. We visit you to talk in detail about what you need, we spend as much time as you want and measure all your belongings, show you our portfolio and really get to know what how you want to use your fitted furniture. You are thinking of buying some bespoke fitted furniture, I have put together a booklet that you should find helpful because it talks about all the crucial points you will need to consider in order to get the very best fitted furniture available. Sign up Today - <a rel="nofollow" target="_blank" href="https://www.empatika.uk/7-biggest-mistakes-people-make/">https://www.empatika.uk/7-biggest-mistakes-people-make/</a> Looking forward to hearing from you! My name is Klaus Thorsen and I am a very experienced Carpenter, Joiner and Cabinet Maker, based in North London. I believe that everyone should have a good local builder, one you can trust and who will deliver you with consistent quality work. My personal commitment to you is to give quality workmanship at good value. I will work with you and your individual requirements so that you are fully happy with what is required for the job and the price, before I proceed. I can bring you over 20 years of experience in the carpentry and joinery trade. My top specialist skills are building bespoke alcove units, traditional sash window internal folding shutters and all kinds of other bespoke, fitted or free-standing furniture and joinery. I can bring your project my years of experience in high spec residential refurbishments, extensions, bespoke kitchen design & build. I am Danish born and was raised in South Africa, hence my history in shipwrights and yacht-fitting. I am punctual, reliable, fit, have a full, clean drivers license and am fully insured. I love my tools and take good care of them. Equally so, I know you love your house and furniture, so I take good care of those too and make sure I leave everything clean and tidy. If you’d like to get on top of your renovation projects, feel proud about your house and cross that to-do list off, then drop me an email or give me a call with your challenge. Antony Smith Carpentry has a wealth of experience in all types of joinery and carpentry. A strong reputation has been established throughout Richmond Borough and the surrounding areas over many years. Attention to detail and the quality of the finish is paramount. Solutions are manufactured to the a client’s individual requirement. For an exclusive, beautiful and bespoke wood based solution contact Antony Smith Carpentry. Fellow Designs make unique pieces of solid wood furniture inspired by natural patterns and textures. At Fellow Designs we are passionate about reusing and re-purposing standard materials, transforming them through design and craftmanship, and elevating them above their everyday function. Fellow Designs also make bespoke built-in and made to measure furniture. Focusing on functionality and the utilisation of space, we collaborate with you, taking your need and style to design and build a unique piece of furniture that will fit perfectly within its environment, whether it’s a stand out piece or a functional necessity. If you looking for bespoke furniture and joinery specialist for your unique project you found one. From the traditional built in furniture to solid hardwood furniture and joinery MJS is always looking to participate in any project however ambitions it is. Our uncompromised quality of craftsmanship and attention to the details guarantees the success of your project. In 2018 MJS will celebrate 5 year anniversary of membership of Guild of Master Craftsmen. We are looking forward hearing from you. We specialise in all types of carpentry, be it a simple shelf to the most complex fitted kitchen. 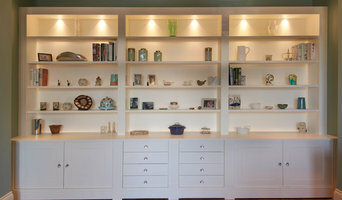 We design and build custom made kitchens, wardrobes and all other bespoke furniture. All our furniture is tailored to your specific requirements, taste and space, then installed by our highly skilled fitters. Our team truly have a passion for wood work so you can be assured that every piece made is done so with the most attention to detail. Our company’s goal is provide carpentry services to a high standard at affordable prices. So if you are looking for a skilled carpenter for a major redevelopment or just that new kitchen, then give us a call to discuss your requirements. From our workshop in Slough, Malax Bespoke Joinery offer a wide range of bespoke residential joinery items across Greater London and Surrey area. From new kitchens to custom furniture you can be sure that your order will be manufactured, finished and installed to the highest possible standard. We pride ourselves on working closely with you to bring your ideas to life. We offer at-home, free consultations with a member of our team to discuss your plans. Then, our expert teams will work with you to create beautiful and functional work. Malax Bespoke Joinery work with only trusted suppliers to ensure high standards, right down to the finish. Each finish is hand applied using only the best stains, oil lacquer and paints. All bespoke furniture items or custom joinery is installed by our skilled team of carpenters to ensure that every last detail is as expected. Call us today to start bringing your ideas to life! We are a boutique client focused studio and workshop offering bespoke fitted furniture. Our passion is to deliver high quality at affordable prices. We can design any items bespoke or choose from some of our pre-designed more affordable options. We work with a large variety of finishes and looks: spray paint; hand paint; wood veneers; high end melamine. We create custom-made fitted furniture built to your specifications. Your bespoke design will be made in materials of enduring quality and with high attention to detail. Our hinged, sliding and all other mechanisms are of high German quality by Blum and come with a 15-year guarantee. Our very own fitters are all full time employees and take great pride in their work and are a pleasure to have in your home. We will start with a design drawing so you can start seeing your piece come to life. Each piece we design is fitted with a fully-lined internal carcass; designed especially for you. We provide a versatile collection of interior accessories, lighting choices and internationally sourced handle collections. When deciding whether to employ a joiner or carpenter in Uxbridge, Greater London, it is best to pick your professional according to their experience on projects similar to your own. For example, installing bespoke joinery such as a staircase involves significant structural work and you might want to work with a carpenter in Uxbridge, Greater London with considerable experience in bespoke staircase joinery. You will often find you need to employ both a carpenter and joiner on a single project, and some firms will offer both skillsets which can simplify your overall hiring process. Where can I find a good Uxbridge, Greater London carpenter or joiner? 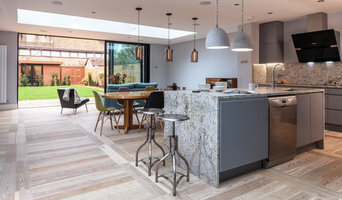 On Houzz there are many professional Uxbridge, Greater London carpenters and joiners that specialise in providing a full carpentry service or bespoke joinery in Uxbridge, Greater London, whether dealing with fitted or freestanding, traditional or contemporary furniture. Simply search for a joiner or carpenter in Uxbridge, Greater London in the Find Pros category, then add images of designs that you like to an Ideabook and contact those on your shortlist. If you need reassurance beyond photos of their work and reviews of previous clients, then you might check to see if the carpenter or joiner is a member of The Institute of Carpenters (IOC), The Guild of Master Craftsmen, the British Woodworking Federation (BWF) or the Federation of Master Builders (FMB). Each asks its members to meet a certain level of expertise and abide by a code of conduct. Have a face-to-face consultation – basic brief and image references in hand – see which joiner or carpenter in Uxbridge, Greater London is the easiest to get along with and who best understands what you’re trying to achieve. How long have you been a joiner or carpenter in Uxbridge, Greater London? Do you offer bespoke joinery in Uxbridge, Greater London as well as standard carpentry? Find a carpenter or joiner on Houzz. Narrow your search in the Professionals section of the website to Uxbridge, Greater London joiner and carpenter professionals. You can also look through photos of woodwork and bespoke joinery in Uxbridge, Greater London by style to find a design you like, then contact the joiner or carpenter in Uxbridge, Greater London that worked on it.